This one is all over Facebook and I can’t track down the source (I’d love to credit the original author). It really made me want to connect with a meeting soon, so I decided to share it here. It’s a simple parable about the struggle of addiction and finding help in the recovery community. You’ll notice it’s the alcoholic version of the Jesus’ parable of the Good Samaritan. 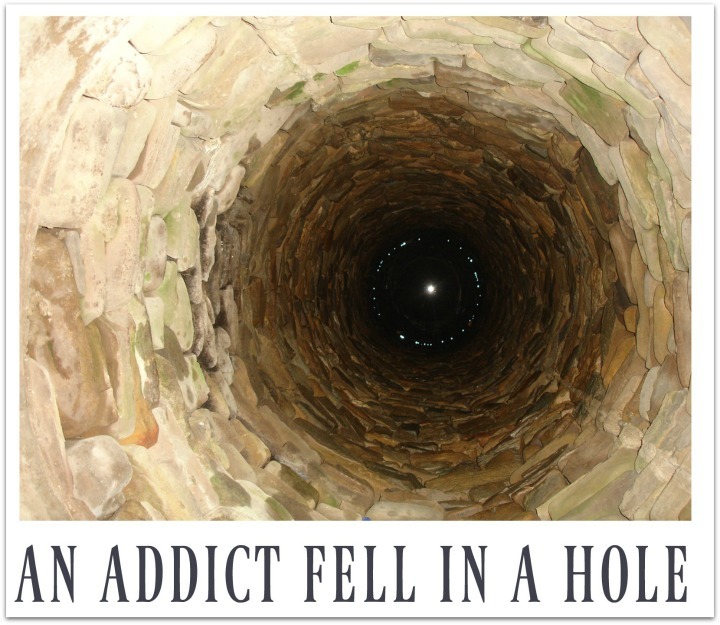 AN ADDICT FELL IN A HOLE and couldn’t get out. A businessman went by and the addict called out for help. The businessman threw him some money and told him to buy himself a ladder. But the addict could not buy a ladder in this hole he was in. A doctor walked by. The addict said, “Help! I can’t get out!” The doctor gave him some drugs and said, “Take this. It will relieve the pain.” The addict said thanks, but when the pills ran out, he was still in the hole. A well-known psychiatrist rode by and heard the addict’s cries for help. He stopped and asked, ” How did you get there? Were you born there? Did your parents put you there? Tell me about yourself, it will alleviate your sense of loneliness.” So the addict talked with him for an hour, then the psychiatrist had to leave, but he said he’d be back next week. The addict thanked him, but he was still in the hole. A priest came by. The addict called for help. The priest gave him a Bible and said, “I’ll say a prayer for you.” He got down on his knees and prayed for the addict, then he left. The addict was very grateful, he read the Bible, but he was still stuck in the hole. I can relate to the experience in this parable. It feels like nobody understood my addiction, much less how to help me quit drinking. Everyone had their theories but it was only the fellowship of other addicts that started me on my path to recovery. You don’t have to fight your substance abuse alone. Please reach out for help today.